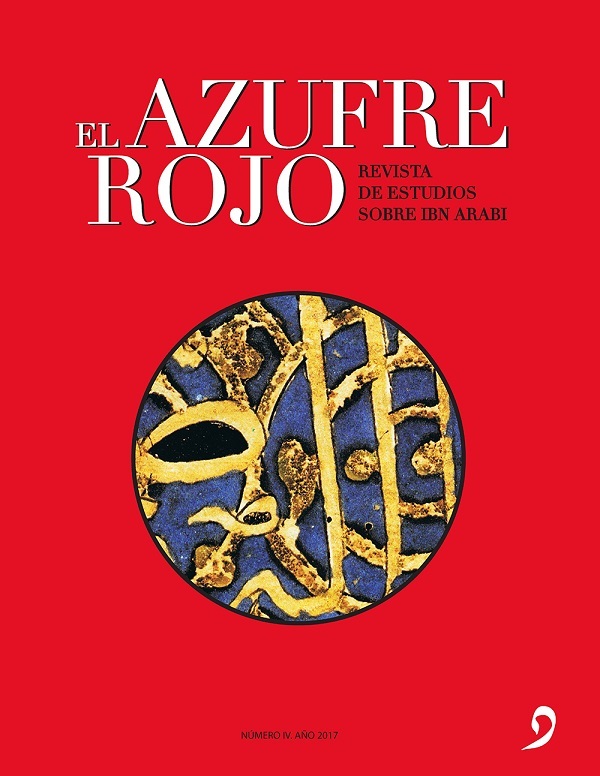 Resumen: La capacidad visionaria que se traduce en valoración consciente de la Imagen como tal, es discernible en toda la obra de Ibn ʿArabī. Según el gran maestro andalusí, el conocimiento más elevado de la desnudez absoluta de la Esencia divina está más allá de toda imagen (la Entbildung del Maestro Eckhart o el Bildlosigkeit de Enrique Suso). Si en contexto de la mística renana del siglo XIII el Maestro Eckhart habla de la «imagen sin imagen» (bîld âne bîld) de Dios, un siglo antes el gran místico persa Farīd al-Dīn ʿAṭṭār se refiere a la Realidad divina en similares términos a las teofanías akbaríes más allá de las formas o de las imágenes: no-imagen (per. naqš-bi-naqš, bi-ṣūra, bi-nišān; cf. el Bildlosigkeit de Enrique Suso), i.e., la imagen original del mundo Invisible. Según Ibn ʿArabī, Él está más allá de cualquier representación, pero también más allá incluso de la ausencia de representación. Las teofanías más allá de las imágenes, que revelan la esencia divina en su completa desnudez, exigen la aniquilación del sujeto, la abolición provisional del yo, que, en el fondo de la experiencia, ignora incluso que está viendo a Dios. Solo puede aprehender ese portentoso hecho una vez que retorna a su conciencia ordinaria: «Si Me encuentras no Me verás, mas Me verás si Me pierdes»; «El que me ve y sabe que me ve, no me ve». El conocimiento supremo de Dios coincide con la ignorancia absoluta del propio yo, estando reservado para quien, sumido en la noche de su nada original, ha olvidado incluso su propio ser. La poesía de Mallarmé y de Rilke nos sirven para introducir, en el contexto de la espiritualidad islámica que nos ocupa, dos temas relacionados con la teología negativa: en primer lugar, el sentido simbólico que en el sufismo la blancura tiene como expresión del mundo invisible, y en segundo lugar, y estrechamente afín con el anterior, la trascendencia, abstracción e ignorancia que, en la mística de Ibn ʿArabī, van vinculadas a las teofanías más allá de las imágenes en el marco de la visión suprema del Increado. Su traslación al arte lo encontramos en los recursos a la pantalla vacía de imágenes en el cine de Robert Bresson o en la extinción de la imagen en el de Abbas Kiarostami. Abstract: The visionary ability that translates into a conscious appraisal of the Image as such, can be discerned in all of the works of Ibn ʿArabī. According to this great Andalusian master, the highest knowledge of the absolute nakedness of the divine essence lies beyond all images (e.g., in the Entbildung of Meister Eckhart or the Bildlosigkeit of Henry Suso). If in the context of the Rhineland mysticism of the thirteenth century, Meister Eckhart speaks of the «image without image» (bîld âne bîld) of God, a century earlier the great Persian mystic Farīd al-Dīn ʿAṭṭār refers to the divine Reality in terms similar to the akbarian theophanies beyond form and image: the non-image (in Persian, naqš-bi-naqš, bi-ṣūra, bi-nišān; cf. the Bildlosigkeit of Henry Suso), i.e., the original image of the invisible world. According to Ibn ʿArabī, He is beyond all representation, but also beyond even the absence of representation. Theophanies beyond images, which reveal the divine essence in its complete nakedness, demand the annihilation of the subject, the provisional abolition of the self, which, in the depths of experience, does not know even that it looks upon God. One only apprehends this prodigious fact on returning to ordinary consciousness: «If you find Me you will not see Me, but you will see Me if you lose Me»; «He who sees me and knows that he sees me, does not see me». The supreme knowledge of God coincides with absolute ignorance of the self. It is reserved for those who, immersed in the night of their original nothingness, have forgotten even their own being. In the context of Islamic spirituality as it concerns us here, the poetry of Mallarmé and Rilke serves to introduce two subjects related to negative theology: the first is the symbolic meaning that whiteness takes on in Sufism as an expression of the invisible world; and the second, which is closely connected to the first, is that transcendence, abstraction and ignorance, in the mysticism of Ibn ʿArabī, are linked to the theophanies beyond images in the framework of a supreme vision of the Uncreated. This vision is translated into art through the use of the blank screen, emptied of images, in the cinema of Robert Bresson and also through the extinction of the image in the cinema of Abbas Kiarostami.